As Financial Reporting Standards (FRSs) in Singapore continue to evolve, the Accounting Standards Council (ASC) has been fairly active on the international stage to assist in the development of accounting standards. In the past month, as has previously been done, the ASC submitted comment letters to the International Accounting Standards Board (IASB) in respect of two exposure drafts, indicating that Singapore is clearly not content to be a mere follower and just adopt whatever international standards are released. The decision to delay the implementation of IFRS 9 Financial Instruments is another clear example of the ASC keeping the interests of Singapore companies close to its heart. Wolters Kluwer continues to be involved in assisting accountants in navigating the changing financial reporting landscape. Aside from our online subscriptions and books, we regularly hold accounting seminars to meet accountants’ needs, featuring such well known speakers as Ng Eng Juan and Francis Rowland. In April alone, we have FOUR workshops to meet the needs of accountants nationwide. Three of them specifically deal with FRSs, and the next upcoming workshop, to be held on 14 April 2015 will deal with the two FRSs issued late last year. FRS 115 Revenue from Contracts with Customers and FRS 109 Financial Instruments will have significant ramifications on the financial reporting landscape, and companies need to be prepared even though the effective dates are a fair while away. Of course, sometimes you just need a refresher, an overall view of all the FRSs released and effective to date rather than focusing on any specific FRS. The seminar on the 21-22 of April 2015 provides exactly that, providing a useful overview of ALL the FRSs. These are the sort of seminars that we find are very popular and thus repeated every year to meet the demand. Whatever your accounting knowledge needs, Wolters Kluwer will strive to make them available for you. We always welcome feedback on our seminars/workshops to ensure its quality and usefulness. If there is any topic that you want covered, do get in touch with us through our helplines or through your regular Accounts Manager. Hope to see you in one of our events! 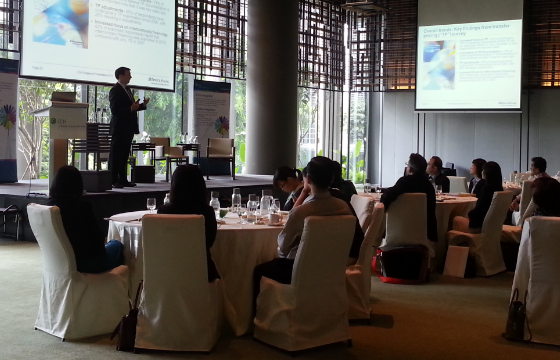 Note: For more information on upcoming seminars/workshops in Singapore, please visit our Wolters Kluwer Events page.